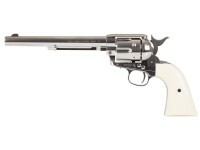 Finally a 7.5" version of the Colt Peacemaker pellet revolver (Single Action Army)! 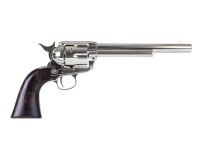 This is the first faithful .177 caliber replica of the famous 7-1/2 inch barrel length 1873 Colt Peacemaker! You'll marvel at the realism of this Colt Single Action Army revolver. Besides the incredible attention to detail on the gun, the box is also a nice surprise. It has a vintage look. *External barrel length is 7-1/2 inches measured from the front of the cylinder to the muzzle. 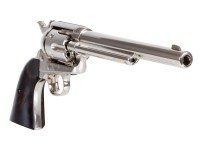 The rifled .177 caliber barrel, recessed inside the .45 Colt barrel, is actually 6.75 inches in overall length. Things I liked: The gun is exactly what I hoped for. The build is phenomenal, and it has weight to it, which surprised me. That definitely let me know it's the real deal. First time purchasing, and was not disappointed by the gun or the website. Things I would have changed: Definitely the synthetic grips. They feel and sound extremely fragile. 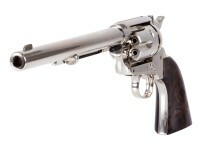 I don't plan on dropping the gun, but if I would, i'm sure the grips would break or get scratched. Possibly looking into custom made grips. While powerful, with it being a CO2 pellet gun, the shooting accuracy is a bit off, but not too extreme. Still enjoyable. What others should know: Definitely a must buy for any wild west reenactment (that allows guns), personal display, or just a fun time shooting in the backyard. Things I liked: The look, the details, the weight, the trigger, the ratcheting sound... the entire package is a very good replica execution. Almost knocked clean out of the park... almost. What others should know: Maybe pay for the 10 for $10 on this one? I'm exchanging mine for another after long debate. I do not find the huge point of impact versus point of aim to be acceptable. I have to aim WAY off target essentially guessing about where it will actually hit. I have conferred with other owners who say theirs are quite spot on. Mine is not. I am a seasoned adult shooter, the gun is the issue. I got my replacement and it is MUCH better... but still shoots somewhat to the left. That's with perfect trigger control, finger placement, proper grip and from a rest. Different pellets and shooters confirm this. Was hoping for a totally bang on replacement but I could be happier with this one as well. Looks only get you so far, then people kinda wanna hit where they aim. Things I liked: The overall quality and craftsmanship is outstanding. I heard that to fit the co2 cartridge in the grip frame they had to use a different frame than the SAA. I heard it was the 1860 army frame. Does anyone know if this is true? does this gun come with both wood looking and ivory looking grips? i heard it did so i wanted to make sure. Is the barrel rifled or smooth bore ? Read the specifications, it clearly states rifled.